It may not be much but making a parachute could be a very fun activity, both for the exercise of knowledge on aerodynamics , or maybe some things more about physics and just for the sheer fun of it. Also, it is a good alternative to common toys seen in the market today. A parachute is a device which uses the effect of drag to slow down its descent from high latitudes. It was invented by a man named Louis-Sebastien Lenormand during 1783 and is not used both for military and recreational activities. Its general design includes a canopy that is made of a lightweight fabric that supports the suspension lines and is supported by tapes. Similar materials are used in almost all forms of parachutes. Here are three modifications on making a parachute. Using the overhand knot, tie each corner of the lightweight cloth. Afterwards, tie each string to the inner edge of the knot allowing the bulk of the knot to stop the string to slip off. 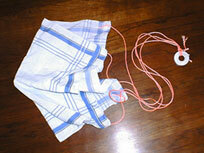 Collect all strings in one hand and pull the center of the cloth using the fingers. Again using an overhand knot, tie all the ends of the strings together allowing, as much as possible don’t leave a space at the end of the strings. Finally, attach the weight to the parachute. If you are using a washer, use a lark’s head knot. To test the mini parachute, try dropping it from shoulders’ height. Make the necessary adjustments to achieve better gliding motion. Cut a 12 by 12 inch sq from the polythene bag. Make a hole on each side of the square. Tie the strings to all sides of the hole, making the length of all strings as uniformed as possible then tie the free ends of the strings using an overhand knot. Attach a paper clip to the tied ends. Meanwhile, make a small model of a person using clay. Estimate the size as to the weight capacity of the parachute. Attach the person to the paper clip. Afterwards, cut a small hole at the center of the parachute about 1 by 1 cm in diameter. To test the mini parachute, the handler should hold the toy on its plastic part and drop it from the highest elevation possible using a chair or a table. Refrain from using this toy outdoors since the wind would easily damage the parachute. Make the necessary design, if using a paper napkin try to be a bit more careful while designing. Clip one end of the strings together then tie the other end to each of the side of the handkerchief or paper napkin, tie them tightly. If cutting holes at the edges of the handkerchief is possible, it is recommendable to make a hole on each side and attach the strings to them. Next, tie the cork to the dangling end of the strings. Finally, test the parachute. NOTE: THESE MODEL PARACHUTES ARE NOT SUITABLE FOR HUMAN FLIGHT. BEWARE OF POTENTIAL INJURY OR DEATH FROM THE USE OF ANY FORM OF PARACHUTE.